If Minneapolis Mayor R.T. Rybak has his way, 71 more police officers will be on the city's streets by next spring. That's just one of several public safety initiatives Rybak announced Thursday in his 2006 budget proposal. Public safety is a key issue because this is an election year, and violent crime has gone up in the state's largest city. Minneapolis, Minn. — Rybak's budget proposal for next year is $1.3 billion, a nearly 3 percent increase over 2005. Most of that increase will go to adding police officers and funding public safety programs. Rybak initially said two weeks ago that he wanted to add 60 police officers to the force, but he has now expanded that number to 71. He says 20 officers will be on the street by next week. The rest will be on the force by springtime. "We do need to continue to grow the police department, and I believe that we can. 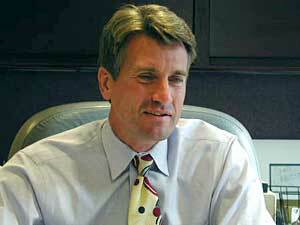 That will take place in a number of different forms," said Rybak. "I think what's important about that is that we are getting the resources on the street and we will continue to deliver them." Rybak's budget increases spending by 3 percent, increases property taxes by 8 percent, hires 71 new police officers, adds safety cameras to neighborhoods that want them, and spends more money to fight homelessness. Rybak says additional government aid from the state, a plan to increase property taxes and a lower debt burden will allow the city to spend more. Rybak is proposing an 8 percent increase in property taxes. Under the plan, a Minneapolis resident who owns a $225,000 home would see an increase of $72 on their city property taxes. Some of the money would provide funding for the city's parks and libraries as well. Rybak's budget also spends money to reduce homelessness in the city, and to hire four new planners to focus on downtown and Uptown. He also wants to restore cuts to the city's public health agency. But the mayor's main focus was public safety. In addition to the cops on the street, he wants to add at least 10 safety cameras to city neighborhoods that want them. There are currently 29 cameras in downtown Minneapolis, and Rybak says they've done a tremendous job in reducing crime. Council member Gary Schiff says he supports the additional cameras as long as neighborhoods ask for them. "The experience in London certainly shows that cameras have a role to play in public safety," said Schiff. "I think the experience in London has changed the perspective of a lot of officials in the United States about the role cameras can play." Schiff and several other city council members say they support Rybak's budget, mostly because it restores police positions that have been cut over the past several years. Schiff and other council members voted last year to restore Rybak's proposed cuts to public safety because they were concerned about crime. The issue has been the central focus of the closely contested race for mayor. Violent crime has gone up in the last year in the city, and Rybak's chief political opponent, Peter McLaughlin, has been using the issue as ammunition. McLaughlin, a Hennepin County commissioner, says when it comes to public safety, Rybak's budget is too little too late. "During his 42 months in office I think he's neglected public safety, and this is a weak attempt on his part to make some amends for that," said McLaughlin. Rybak's other main initiative is helping citizens navigate the complicated maze of city government. Rybak's budget proposes setting up a helpline were any citizen can dial 311 on their phone when they need help with sidewalk repairs, a downed tree or any other basic city service. "I believe when this is done, it would be one of the most significant innovations we have in just delivering the basic core services," Rybak said. That initiative would cost the city $2.5 million a year. Some city council members say they'll reluctantly support Rybak's budget, but have mixed feelings about the property tax increase. Council member Barbara Johnson says many of her constituents are frustrated that property taxes continue to go up. "People say, 'I'm living on a fixed income, how am I going to pay 8 percent more? My Social Security didn't go up 8 percent,'" said Johnson. The council rarely strays too far from a mayor's proposed budget, so it's unlikely there will be major changes to Rybak's plan. The council has until December to pass the measure.